As the battle royale-royale heats up, see whose got the biggest guns. Call of Duty‘s first battle royale mode is in full swing. The Black Ops 4 Blackout private beta went live on PlayStation 4 earlier this week. Many of these players are coming from the major competing battle royale games Fortnite and PlayerUnknown’s Battlegrounds, which have dominated video games for much of the past year. While some have joked that Blackout will be the game mode to finally take down Fortnite, there is no doubt some key similarities in Blackout will draw in some of Fortnite’s massive audience. Some differences are out in the open: The price and perspective. Fortnite offers a free-to-play, third-person experience, but Blackout is a part of a $60, first-person game that has become a staple in shooters. But there are many more differences that set Blackout apart that can only be sussed out by playing it. One of the factors that set Fortnite apart from the other battle royale games was style. 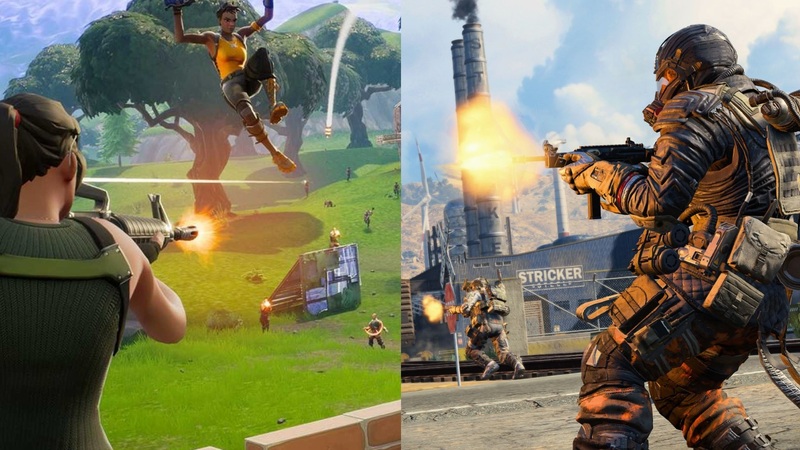 Rather than designing a visually realistic, military-inspired BR like PUBG, Epic Games decided to make Fortnite into a more cartoon-like game, which has attracted players of all ages. Blackout certainly isn’t exactly realistic either—it features the iconic Ray Gun from Zombies. But not many would consider it cartoony either. Like other battle royale games, Blackout forces you to loot quite a bit. As you search for weapons, attachments, perks, backpacks, and armor, you may encounter other players or even Zombies in certain parts of the map. The extended looting can feel tedious to some, but others have expressed their enjoyment of a game that seems to have taken inspiration from the likes of DayZ or ARMA instead of more immediate hits. Fortnite has its vehicles, sure. A Shopping Cart was added in June and joined by the All Terrain Kart in July. But Blackout offers a drastically different vehicle experience. The ATV, Cargo Truck, Tactical Raft, and Light Helicopter give Blackout players their choice of what type of assault they want to launch on their opponents. The Blackout map is large, but with quick and easily-accessible vehicles, it makes it pretty easy to move around and beat the deadly storm. The ATV can be a little crazy as a passenger, with how quick it goes, but the Cargo Truck can feel like a giant lumbering turtle its size and speed. Each one can work in different situations, but pick wisely. For example, the truck came in handy for a teammate and I when we were without weapons and needed to find a safe getaway. The ATV was perfect for chasing down weaker players and trying to gain more loot for ourselves. The Light Helicopter is a solid choice. It certainly gives you the high ground, but it’s also loud and noticeable, making it dangerous to get comfortable in. The Raft helps you get around bodies of water quicker, but the noise in the water can attract some unwanted attention. Thanks to building, player-vs-player fights in Fortnite are truly unique. Fortnite allows less weapon-savvy players to outmaneuver and confuse opponents using their own towering labyrinths. In Blackout, which puts traditional Black Ops combat on a much larger scale, the players must focus on gunfights even more than the average Call of Duty game. Instead of farming up materials for building show-downs, you better pick up a strong scope, some additional attachments, perks, and armor. If you only have one hand free, pick up the armor. It really can be the difference between death and an elimination. Fights can feel few and far between. With less than 100 players in the lobby and a large map, there can be some games where you feel like there’s no one else on the map. Dropping within earshot of the major locations is a good choice if you want to loot and not worry about others, but as I’ve learned, you might have to deal with several rotating players afterward. This may change outside of the beta. We have to reiterate that armor essential in Blackout. Instead of consuming shield-enforcing potions like Fortnite, Blackout instead makes players loot for armor, which comes in three levels. While there has been some pushback from the community on the strength of the third level of armor, Blackout differentiates itself from Fortnite in this key element. Armor can be immediately equipped, unlike Fortnite’s drinking animation. The downside of armor in Blackout is that you cannot store any. Once you equip one set of armor, that’s the only one you can have until it’s destroyed. If you get the strongest level of armor, though, it’s going to be tough for others to rip through it in a traditional gunfight. Armor also can be easier to find than something like a large shield pot in Fortnite, which are rarer to find than most basic armors in Blackout. In Fortnite, it’s all about item and weapon rarities. The more rare something is, the better it typically performs. Blackout differs from this, making it so weapons and items can be improved only through additional attachments and perks that you can find on the map. Some guns are certainly better than others, but nothing is set as above another in rarity level. The attachments can easily make or break a weapon, with players forced to search for a sniper scope to go along with sniper rifles in Blackout. It can feel like a little much to find the best combination of items. There are so many perks, attachments, weapons, ammunition, and healing kits that it can almost become overwhelming. When starting up the game, it’s confusing to know exactly which ammo goes with which gun, a difference from Fortnite, where there are only a few different types. Luckily, it’s pretty easy to look on the menu to find what certain items do. To new players, it may be difficult to get accustomed. You can only hold two guns at a time in Blackout. Fortnite allows up to five weapons in one inventory, but Blackout limits it two while allowing players to hold numerous perks, attachments, and more.